"Have we got a corpse?" I suppose that's the first question asked in certain types of police procedurals. And, of corpse, if there is one, the next question is "Whodunit?" Sometimes, however, the evidence is murky; the suspect elusive. Is there more to the story of a man's untimely death or disappearance? Is someone withholding a crucial piece of information which could shed light on the case -- or maybe even exonerate a suspect? These questions and many more lie at the core of two recent Bay area premieres. One starts off as a formulaic police procedural which develops a decidedly unexpected gay twist. The other is a failed Broadway musical in which an obsessive detective proves to be much less stageworthy than his cinematic equivalent. In each case, the smoking gun is not what the audience expects. 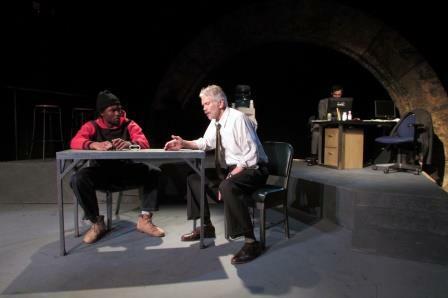 "...to promote new works utilizing top-notch directors and actors. The presentations have limited design elements and are to be promoted primarily online, thus reducing the costs and risk of each production. By reducing risk, the Sandbox Series is designed to bridge the gap between 'readings' and 'main stage' productions and thus provide increased exposure to the new voices in American Theater." 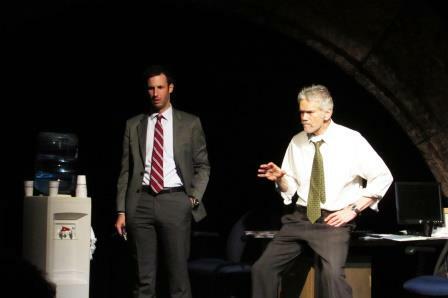 Directed by Susi Damilano on Bill English's stark unit set, Rossi's play finds two Irish police detectives trying to understand how a man could have fallen from a Manhattan subway platform (or leapt or been pushed) to his death late one night with seemingly no provocation. Of course, the investigation might go smoother if one of the policeman was not an obnoxious textbook-quoting rookie and the other a jaded cynic suffering from ocular migraine attacks. But as the younger, oh-so-sure-of-himself Detective Jack Flanagan (Matthew Baldiga) tries to get the suspect -- a young black man named William (Isiah Thompson) -- to sign a confession, the older, more streetwise Detective Denny Mitchell (Charles Shaw Robinson) smells a rat. This rat is not one of the standard issue rodents that can be seen scurrying around New York's subway tracks, but the kind of missing data that indicates Flanagan might be prone to some pretty sloppy investigatory work. From Red To Black is not so much a good cop/bad cop scenario as a rookie cop coming up against a third-generation veteran cop as they analyze the same death from radically different perspectives. The key to the puzzle apparently does not lie with the suspect. William may be a mouthy black teenager full of attitude, but he's basically a scared young kid from the projects who has seen too many of his peers die at an early age or end up in prison (where he fully expects to spend a good part of his life). The transcripts of the police interrogations of other witnesses indicate that William's best friend didn't hesitate to turn on him under pressure from the cops. As William describes what happened on the subway platform, it seems quite likely that he could have pushed the decedent in front of an approaching train. 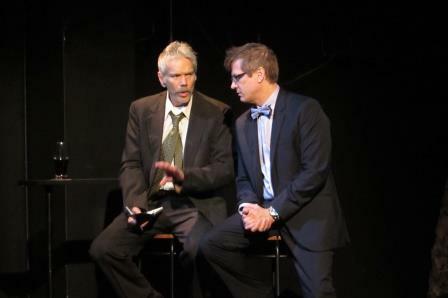 Until, of course, Detective Mitchell asks William to reenact what happened. With William's responsibility for the decedent's death now in question, Detective Mitchell pays a visit to one of the decedent's co-workers, an out and proud gay man named Lawrence Stevens (Michael Shipley) who explains that, although married and with children, the victim was a closeted homosexual struggling to come to terms with his sexual orientation. Detective Mitchell also learns that the firm's insurance policy refuses to cover any suicide that occurs before a policyholder has been employed for two years. As Stevens explains, the decedent had only been working for his employer for a year and a half (which would rule out a motive to commit suicide in order for his wife and kids to get a settlement from the insurance company). What, then, could determine whether the decedent was pushed off the platform by William or by a crushing sense of hopelessness, helplessness, and the kind of self-loathing that results from living a closeted life? Rossi's dialogue is sharp, tough, and keeps shifting the play's focus from the tension between the two Irish detectives to their efforts to get a confession out of William and Detective Mitchell's curiosity about how Stevens fits into the picture. Needless to say, Detective Mitchell has some fetishistic emotional baggage of his own to deal with. 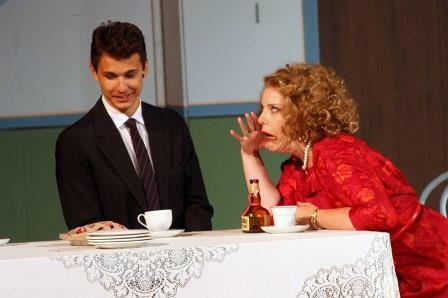 Under Susi Damilano's direction, the cast of four kept the tension level high on opening night. Rossi's one-act, 75-minute play (which only requires a unit set and minimal costume expense) should have a bright future in regional and community theatres. 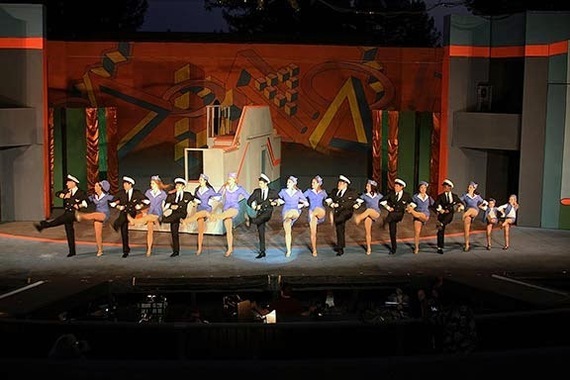 Producers Associates (the presenters of the annual Woodminster Summer Musicals in Oakland's outdoor amphitheatre in Joaquin Miller Park) like to include one show each season that is not as well known as such box office favorites as Fiddler on the Roof and The Sound of Music. 2014's lesser-known show was 2011's musical adaptation of Catch Me If You Can with a book by Terrence McNally, music by Marc Shaiman, and lyrics by Scott Wittman and Marc Shaiman. Based on the 2002 film starring Leonardo DiCaprio and Tom Hanks, the story follows the real-life antics of Frank Abagnale, Jr., a charming con man who became a master check forger and impostor. His ability to evade the FBI was due, in part, to his skill at impersonating a Pan American World Airways pilot (it is estimated that Abagnale flew 250 flights covering a total of one million miles between the ages of 16 and 18 while billing his food and lodging to the airline). Abagnale showed similar skills at impersonating a teacher's aide, a doctor, and an attorney. After serving time in solitary confinement, he began to work for the U.S. Government and eventually established a financial fraud consulting business known as Abagnale & Associates. The success of Steven Spielberg's 2002 film adaptation of Abagnale's book offered plenty of inspiration for the con artist's pranks to be adapted for the musical stage. 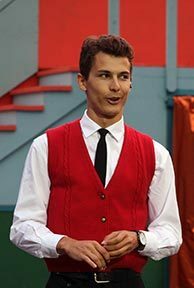 The story of a charming rogue invoked memories of J. Pierrepont Finch's rise to the top in 1961's Pulitzer prize-winning musical, How to Succeed in Business Without Really Trying. At a time when Mad Men was driving audiences into a frenzy for 1960s nostalgia, Abagnale's adventures seemed like a great way to combine the sounds of 1950s pop culture with modern stage technology. Choruses of leggy stewardesses and horny, high-kicking nurses in uniform seemed perfect to entertain the tired businessman. But on April 10, 2011, when Catch Me If You Can opened on Broadway at the Neil Simon Theatre with a cast headed by Aaron Tveit and Norbert Leo Butz, the reviews were mixed at best. Despite the input from so many seasoned Broadway professionals, the show closed on September 4 after a run of only 170 performances. Terrence McNally had worked on musicals like 1984's The Rink, 1992's Kiss of the Spider Woman, 1996's Ragtime, 2000's The Full Monty, 2001's The Visit, and two operas by Jake Heggie (2000's Dead Man Walking and 2008's Three Decembers (Last Acts)). Marc Shaiman and Scott Wittman scored a major hit with 2002's musical adaptation of Hairspray. 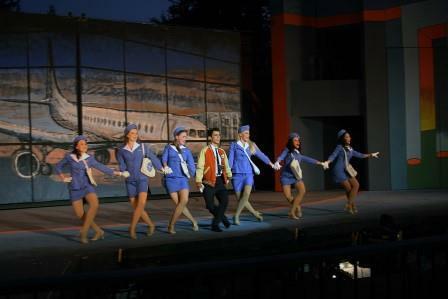 A chorus of airline pilots and stewardesses joins Frank Abagnale, Jr.
Ben Franklin in Paris (215 performances). A Tree Grows in Brooklyn (267 performances). On A Clear Day You Can See Forever (280 performances). The Happy Time (286 performances). As directed by Joel Schlader (with choreography by Christina Lazo) it quickly became evident that the show's biggest weakness was Terrence McNally's book. 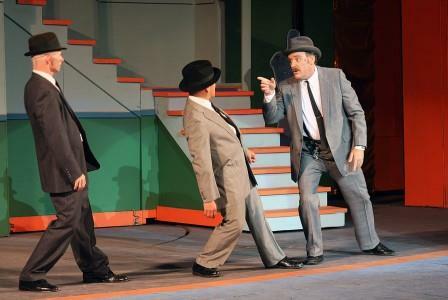 I've never seen a show in which every time the villain (in this case Jonathan Leavy as FBI Agent Carl Hanratty) arrived onstage, the proceedings ground to a dismal halt and the show's energy evaporated into thin air. Not only did Catch Me If You Can have one of the lamest first act curtains, I can't remember seeing another musical whose second act tanked so badly. Robert Moorhead's portrayal of Frank Abagnale, Sr. was surprisingly bland -- almost like an anemic version of J.B. Biggley. Jonathan Leavy put a lot of effort into Carl Hanratty but was unable to squeeze much blood out of the character. Katie Pogue (as Cheryl Ann), Taylor Chalker (as Brenda Strong), Jennifer Stark (as Carol Strong), and Rod Voltaire Edora (as Agent Dollar) all tried to breathe life into smaller roles. That's not to say that the evening was a total loss. Nikita Burshteyn gave a thoroughly charming performance as Frank Abagnale, Jr. with Kathryn Zdan scoring strongly as his French mother, Paula Abagnale. The bottom line? Despite a zippy opening number ("Live In Living Color"), Catch Me If You Can is an extremely weak show. What saved the evening was Burshteyn's endearing performance as a handsome young con man who continually manages to get away with murder.